As the number of devices in your environment increases, so does the need for scalable, globally available services to manage them. 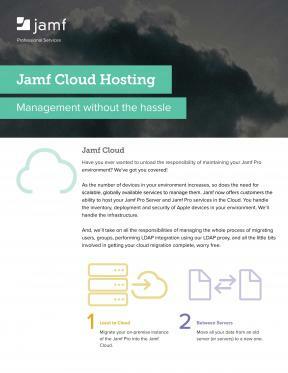 Jamf now offers customers the ability to host their Jamf Software Server (JSS) and Jamf Pro services in the Cloud. You handle the inventory, deployment and security of Apple devices in your environment. We'll handle the infrastructure.